Hi,I am 13 and live in India. The place where I live doesn't have proper ballet school or classes and I want to become a professional ballet dancer in the future . In India, there's almost no scope for Western dance, that's why i want to study and complete college outside india. I am thinking of going out of India after I complete 9 grade/when I turn 15. My parents have no problem with me dancing or sending me out. But there is a problem that my family faces-money problems. My mum says that she won't let it turn a dream breaker. But I am worried about my body shape. I don't have a completely flat stomach but just a little fat and I have heavy thighs and chest. Please can you suggest a good diet, tips and exercises for me. Thank you for contacting me, it's great to hear from you. I would like to be here to help your situation and if you keep looking through my website, there are many worthy pages of advice which give you more of an insight into ballet dancers and how you can become a professional. it all starts from what you want and how much you are determined for this type of career. If you have a good plan, support and talent for the dance world then it will give you a good head start. 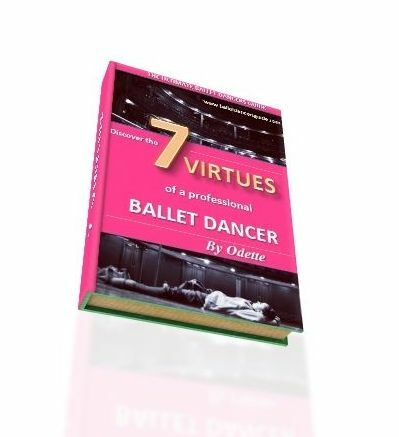 I explain this more in my book, "7 Virtues of a Professional Dancer". It will take money to start your training, auditions and flights to move to another place out of India. This is something you will need to seriously consider with your family and talk about how it will be possible for you. If you know it's something you want, then start already researching online ballet schools you would like to study at abroad and make a list of all these places, as well as all contact details to keep handy if you decide to go ahead. The body of a ballet dancer is something you can work hard for as you train, but it also a physique which comes more easily to some than others which is why many young dancer's are knocked out at the early stages. It's not something you can force, or go to extreme measures for, because eventually it will get the better of you. However, I recommend a healthy balanced diet with plenty of fruits and vegetables, as well as lean proteins and nourishing real foods like sweet potato, lentils, salads, beans etc. I hope this helps and please keep in touch!